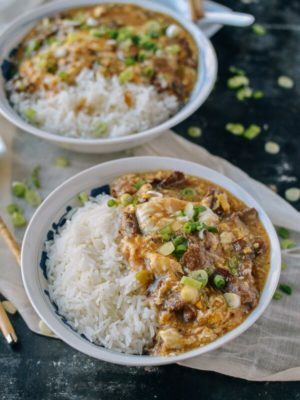 I don’t claim that this Scallion Ginger Cantonese crab is the easiest recipe to make, but follow these directions and you’ll be in for a real treat. Really, the challenge comes from uh…dispatching and prepping the crab. 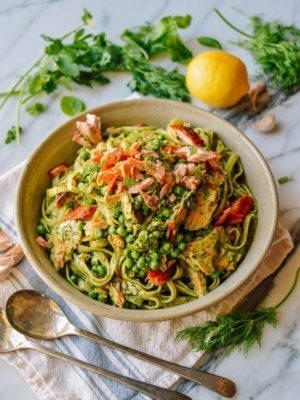 Once you’ve gone over that hurdle, it’s very quick and easy to cook. 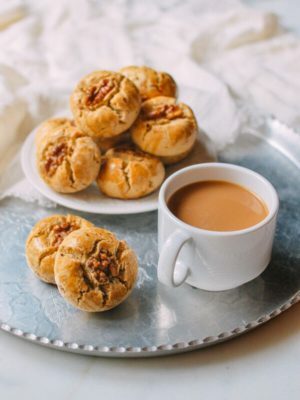 In fact, you must have everything completely prepped and ready before you turn on the stove, because everything happens so quickly. 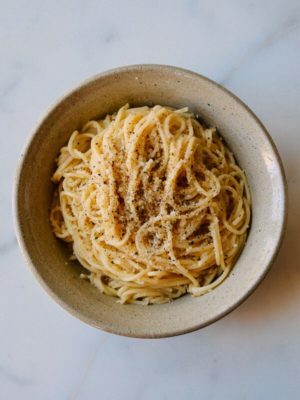 I’ve seen many people try to make this dish without getting it right, and this is the most comprehensive step-by-step, authentic recipe you will ever find. 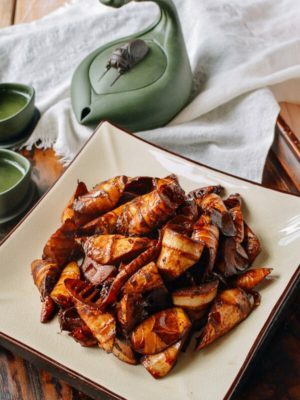 Mainly, I wanted to make this available to Sarah and Kaitlin so this detailed ginger scallion Cantonese crab recipe won’t get lost in future generations. After you’ve tried it a few times, you’ll realize it’s really not that hard! 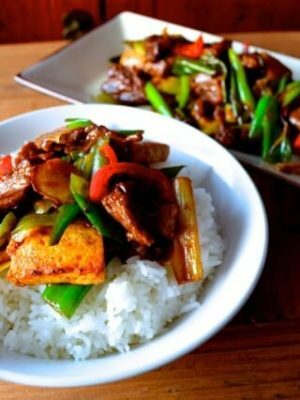 Every time I make this dish, people walk away thinking they’ve been to Chinatown for a meal. First thing’s first: find a good fish market to get live crab. The second choice would be the supermarket, but I have generally found that it’s difficult to find fresh crab there. I prefer blue crab when they are in season, which is generally late summer in the US. Here in Beijing, it’s August through September. 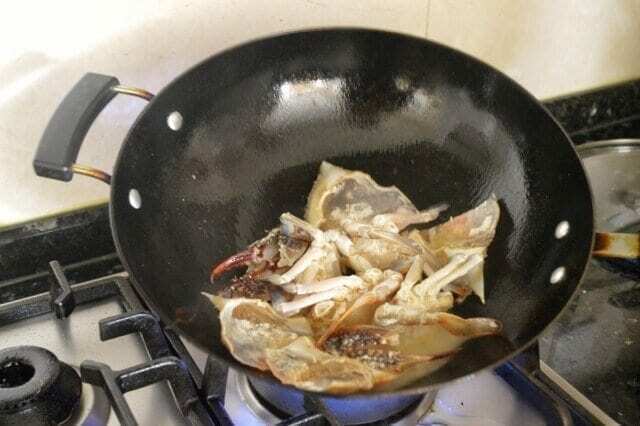 For this recipe, don’t use lake crabs, as the preparation would be different. The pictures should give you a good idea of what you are looking for. The fish monger will generally ask you if you want male or female crab, and what you choose depends upon the season and whether you like crab roe, which makes the dish even more savory. 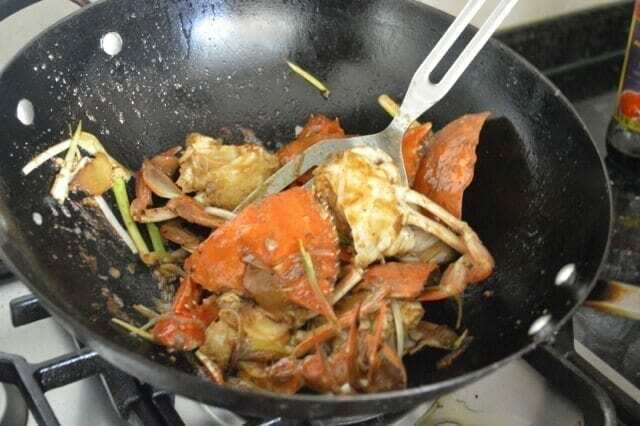 At the time I cooked this recipe, the female crabs didn’t have any roe, but it’s good to get them when they do. The easiest way to tell the difference is the visible roe or to check the flap at the bottom of the crab. Females usually have a wider flap than the males, but this is where a good fish monger is helpful. He or she may be able to help you prep the crabs as well. If not, just read on! 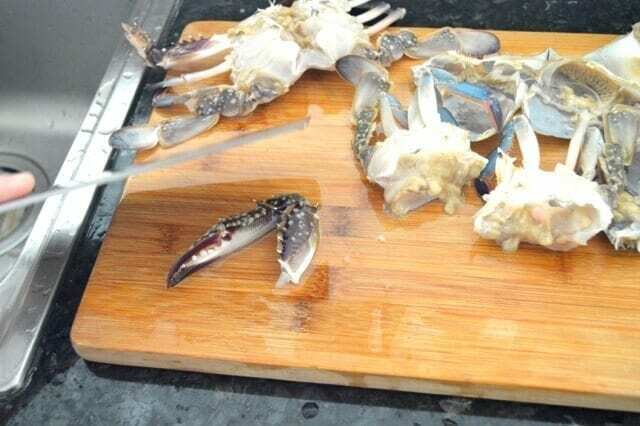 Put the crabs into the refrigerator for 5 to 10 minutes to slow them down enough for easy handling. 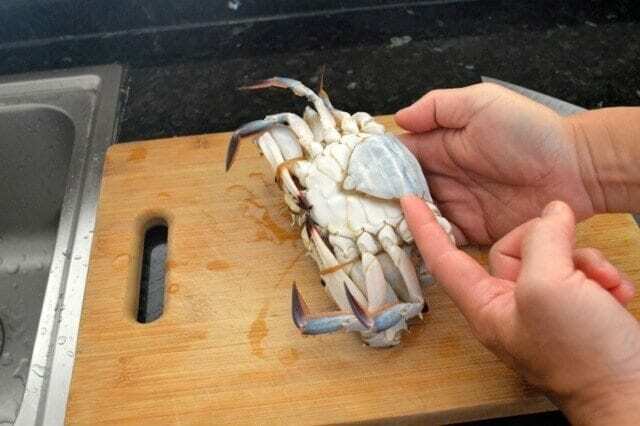 Usually, crabs have rubber bands around the claws, but if not, the best way to handle them is to hold them from the back as pictured so that you’re always out of reach of their claws. 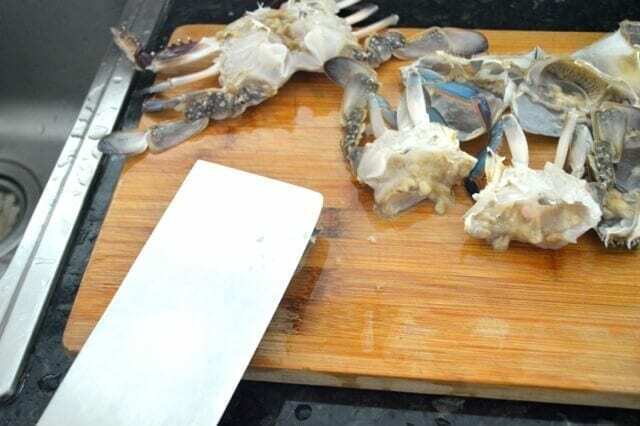 Transfer the crab to a cutting board. 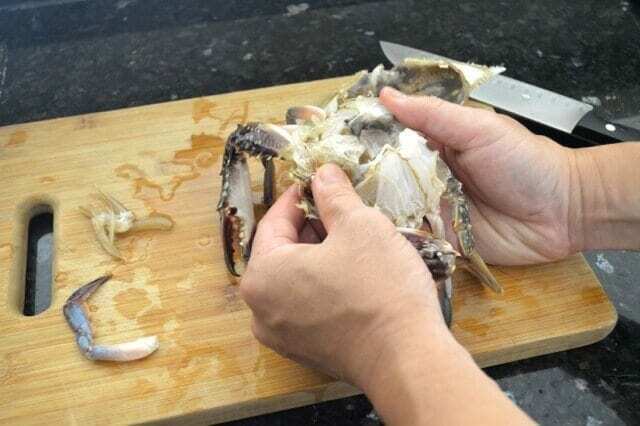 Use a firm grip to remove the flap under the crab. See that wider flap which indicates a female crab! 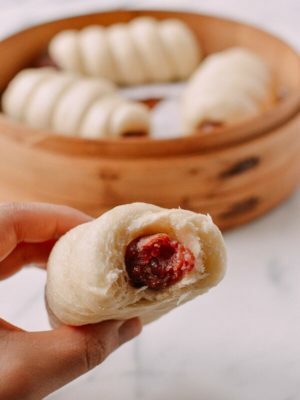 Take out the mouth parts and the stomach, which is directly behind the mouth. You can remove roe and “mustard” (the green stuff) but I suggest you leave it in there. If you’re a beginner, then you can just remove everything. And yes, the pictures aren’t exactly appealing. No one said this was all rainbows and bunnies. 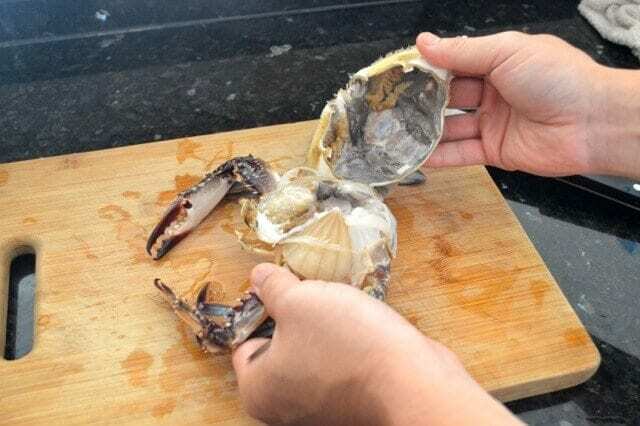 The outer crab shell also has that “mustard” as well so remove the portion of the crab “mouth” there and carefully clean and rinse the shell. Remove the inedible gills on both sides of each crab. 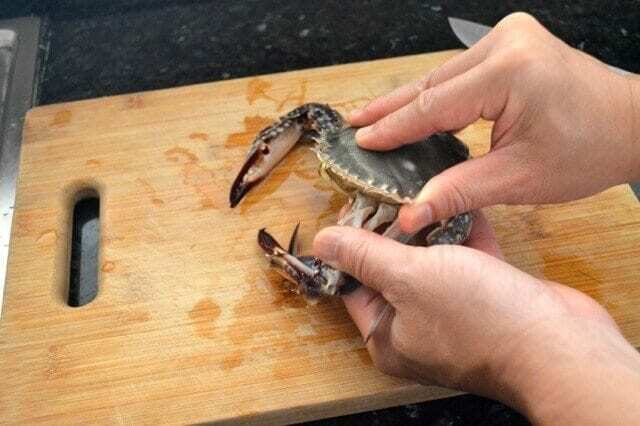 Rinse and clean the crab under running water to remove any sand. 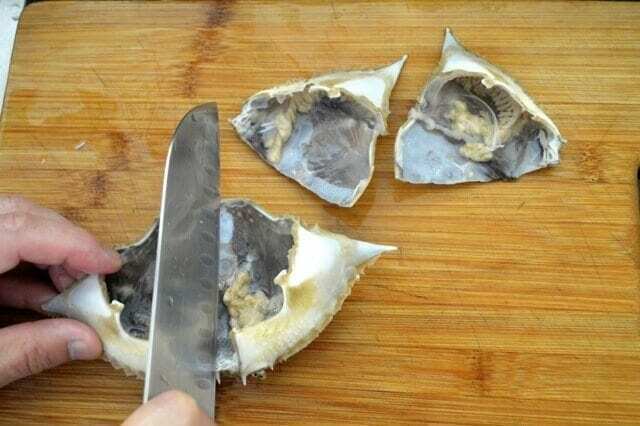 Cut each top shell in half to make the pieces more manageable. 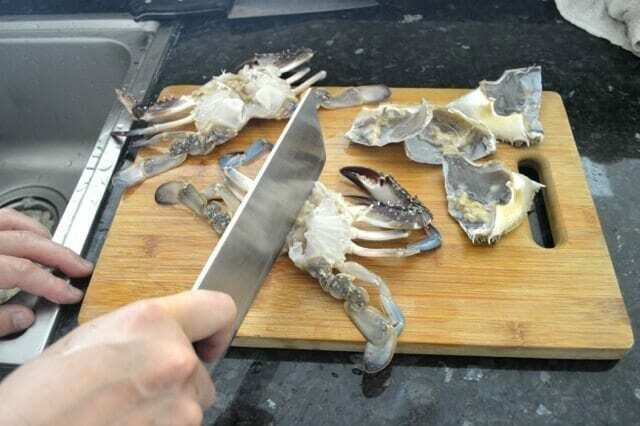 Then cut each crab in half. Place all the cut pieces in a colander to let any excess water drain off. 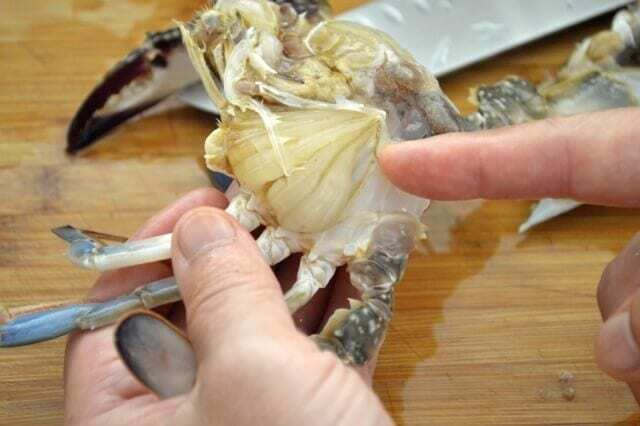 Remove the claws with a cleaver or sharp knife. You can also remove them simply with your hands. 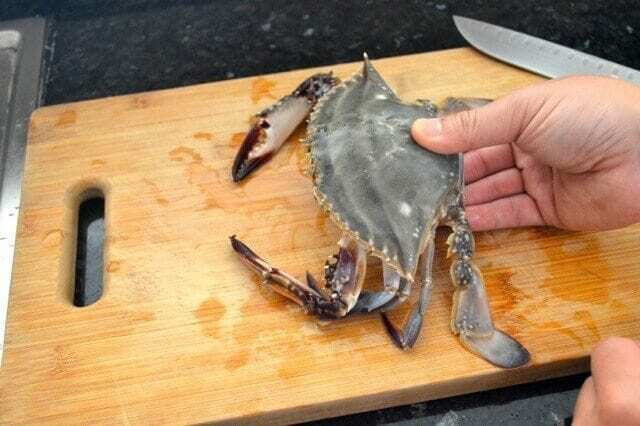 Set the claws on a cutting board and give each one a light “whack” to crack it for easy eating later. 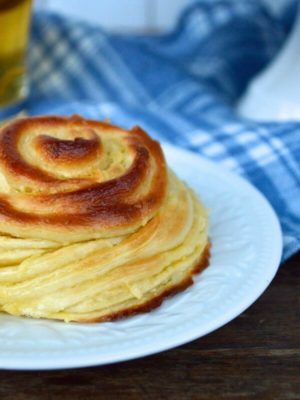 You can skip this step if you prefer to leave it in tact and just use a crab cracker later. 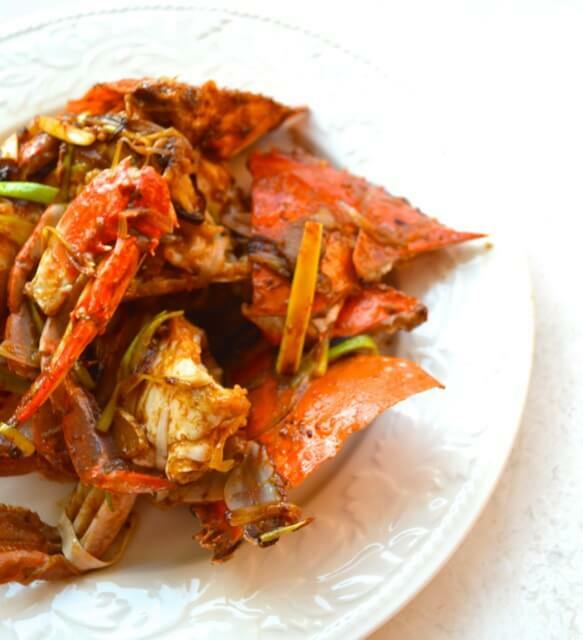 This ginger scallion Cantonese crab dish should be done in two steps in the wok. The first step is to dredge the crab in flour and sear it. 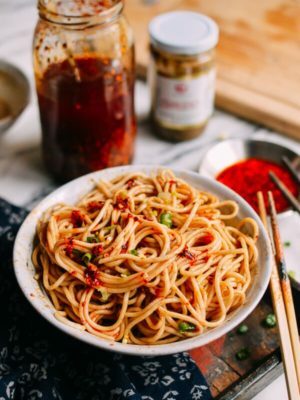 This seals in the juices and flavor before you stir-fry it. 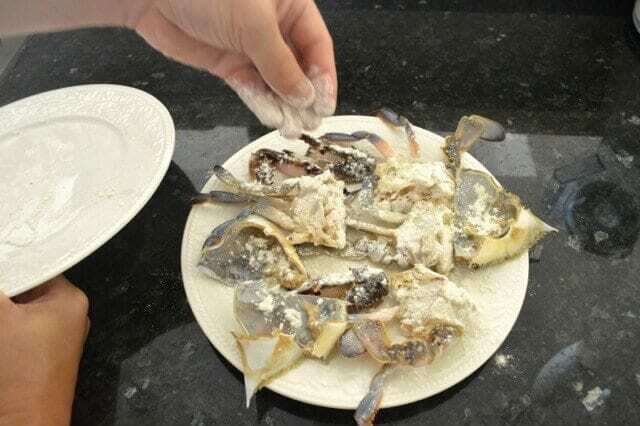 Take each of the crab halves and lightly dredge each piece in flour. 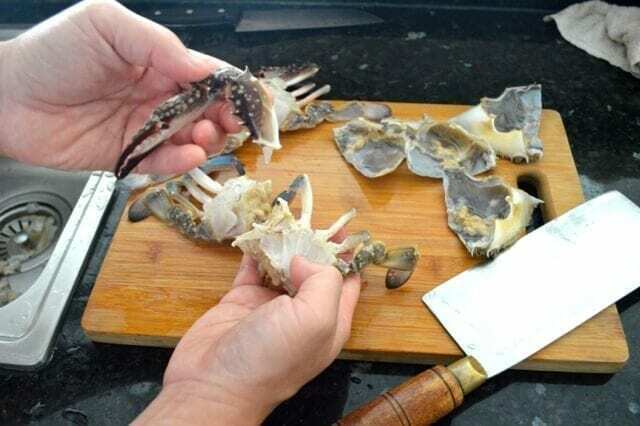 Set the pieces on a clean plate and transfer the claws and shells to the same plate. Sprinkle the remaining flour over the crab pieces lightly when you are done. 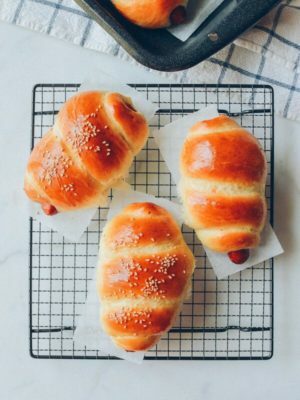 You don’t want to drown it in flour…just get the meaty spots with a light coating. 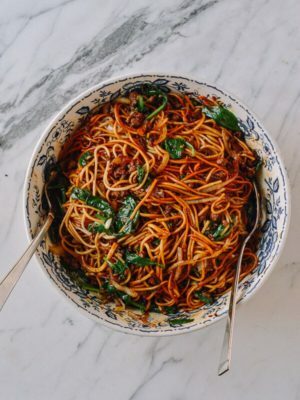 Heat a wok with 4 tablespoons of oil and swirl the oil around so it heats evenly. You know you’ve reached the right temperature when you start to see just a little (not a lot!) of smoke on the sides of the wok. 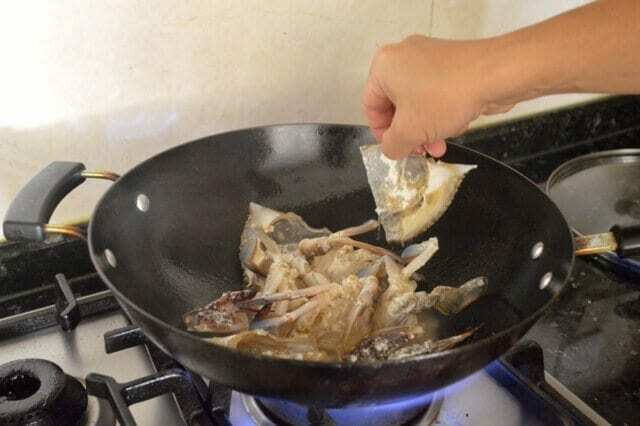 Now quickly place the meatiest pieces of crab in the oil and spread the claws and shells around the outside portion of the wok so that everything is in one layer. 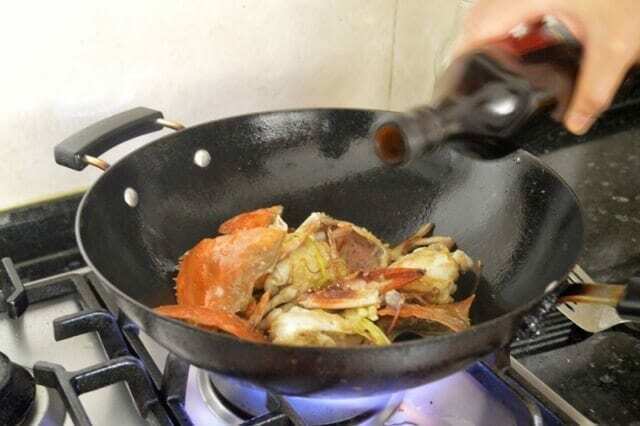 Next, quickly tilt the wok around in a circle to get the oil spread around to all of the crab pieces. Keep the heat on high. After another 15 seconds of this, use a metal spatula to roll the pieces around the oil for another 15 seconds. Turn off the heat and remove to a plate or small sheet pan. At this point, the crab should be about 50% cooked. 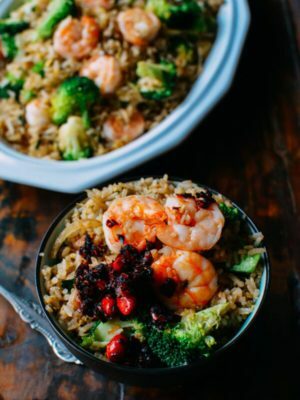 Clean the wok (don’t skip this! 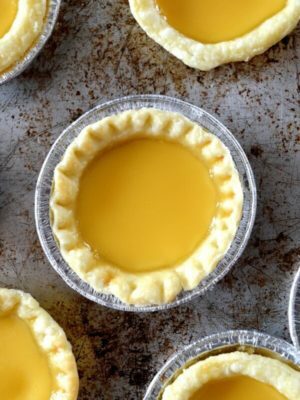 ), put it back over the heat, and add 2 tablespoons of oil to it. 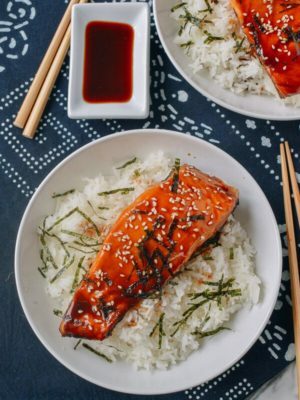 Toss in the ginger pieces and cook until they are just starting to crystalize (15 seconds) and then add half of the scallions – use the whiter ends for this step and save the green part for later. 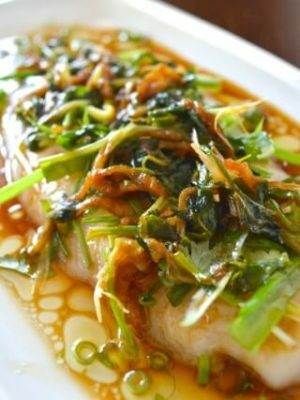 This process infuses the oil with the ginger and scallion flavor. Keep the heat on high and move quickly to add the crab back to wok. 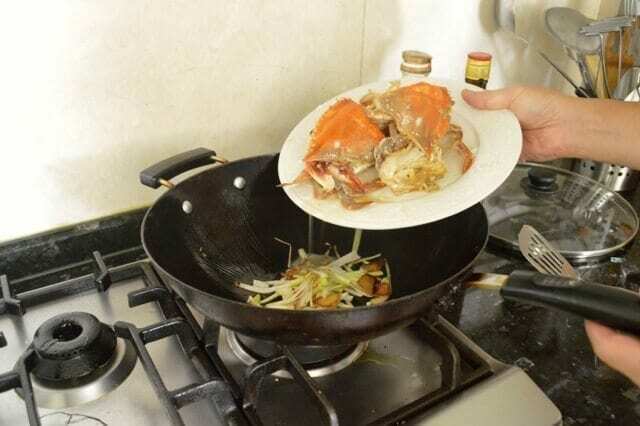 Now, quickly and continuously toss the crab with your spatula to get some good wok sizzle. 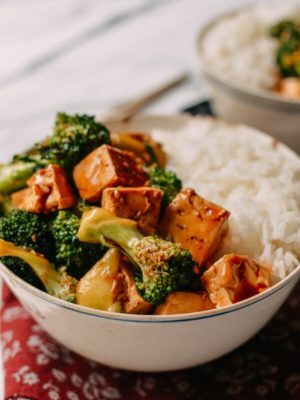 After about 10-15 seconds of “wokking,” add the wine in a circle around the pan all at once and immediately cover the wok and turn the heat down to medium. 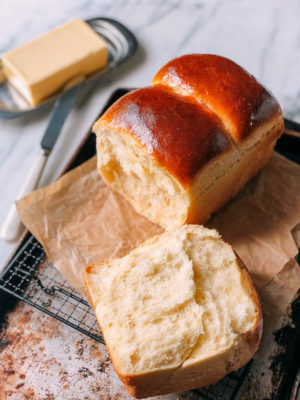 This is the “baking” process that makes this dish so flavorful! 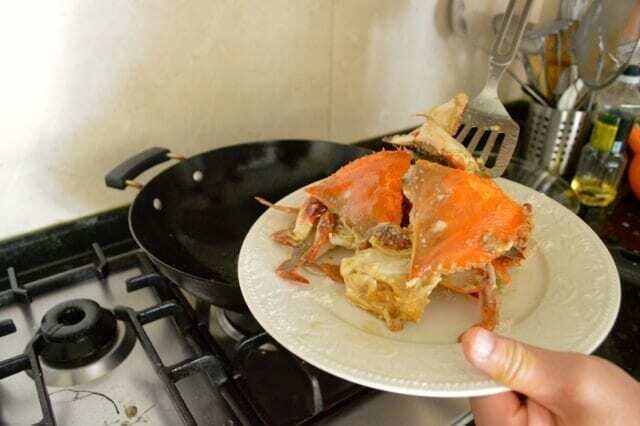 Let the crab cook like this for 2 to 3 minutes. During this process, it’s best to hold the cover and tilt the wok so the liquid hits the hot sides of the wok and you hear and see a sizzle generating that elusive “wok hay” flavor. If you have no sizzle, the heat is too low. Remove the cover and spread the rest of the scallions over the crab. Add the sugar, the white pepper and the soy sauce and give everything a good mix for another few seconds. By now, any liquid should be a sauce now thickened by the flour, coating the crab. If you still have some liquid in the bottom of the wok, just turn up the heat and continue to stir-fry until it’s coating the crab. And that’s it! Plate and serve. 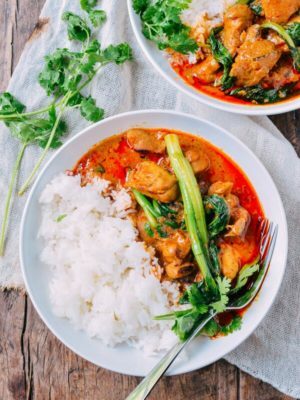 Enjoy this yummy lip smacking dish – Judy certainly does! 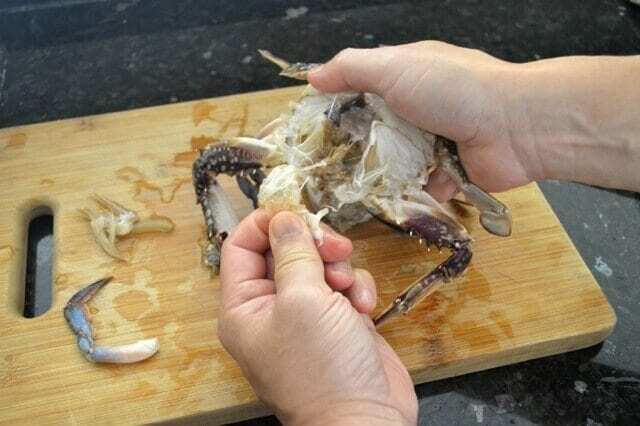 Clean and prep the crabs for cooking (see step-by-step instructions within this post). 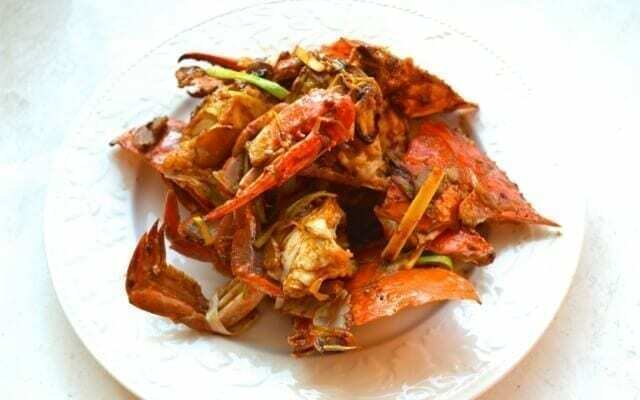 Take each of the crab halves and lightly dredge each large piece in a light coating of flour. Transfer to a clean plate along with the claws and shells. Sprinkle the remaining flour over the crab pieces. 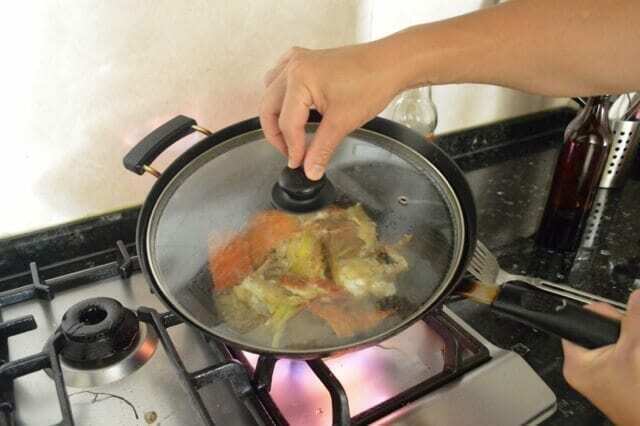 Heat a wok with 4 tablespoons of oil, spreading the oil around the wok so it heats evenly. You know you have reached the right temperature when you start to see just a little (not a lot!) of smoke on the sides of the wok. Now quickly place each of the large pieces of crab in the oil and spread the claws and shells around the outside portion of the wok. Next, quickly tilt the wok around in a circle to get the oil spread around to all of the crab pieces, keeping the heat on high. After another 15 seconds of this, use a spatula and roll the pieces around the oil for another 15 seconds. Turn off the heat and remove to a plate or small sheet pan. 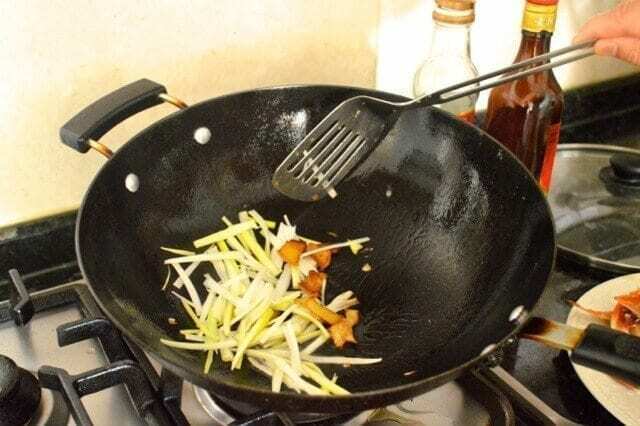 Clean the wok, add 2 tablespoons of oil and toss in the ginger pieces until they are just starting to caramelize (15 seconds) and then add half of the scallions – use the white pieces for this step. 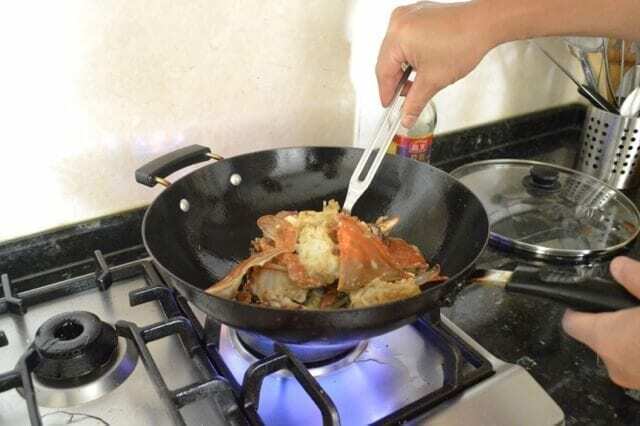 Keep the heat on high and move quickly to add the crab to wok and toss the crab around with your spatula to get some good sizzle. 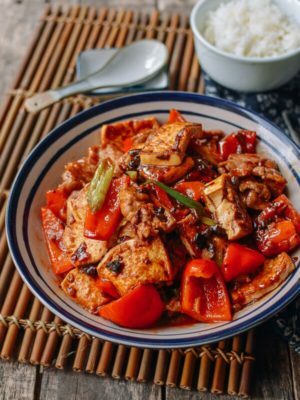 After about 10 seconds, add the wine in a circle around the pan and immediately cover the wok and turn the heat down to medium. Let the crab cook for 2-3 minutes. During this process, it is best to hold the cover and tilt the wok so the liquid hits the hot sides of the wok and you hear and see a sizzle generating that elusive “wok hay” flavor. If you have no sizzle, the heat is too low. Remove the cover and spread the rest of the scallions over the crab. Add the sugar, white pepper and soy sauce. Give everything a good mix for another 10 seconds. Plate and serve! Just need a bit more sauce, suggestions? Seafood, Vegetable, Chicken broth? Thank you for this! ✌️❤️?. &. ???? Hi Captain Chris, adding any of those broths will be just fine! Be sure to mix a little cornstarch and water to thicken the sauce if needed. Happy crabbing and cooking!